IsleofSkye.com: the ultimate guide to the Isle of Skye in the Highlands of Scotland. Helping visitors find some where to stay from our large selection of Accommodation, we have listings for Bed and Breakfast, Self-Catering Cottages, Campsites and Hotels. Our Skye Guide has an expanding collection of Activities and Attractions. If you would like a walking guide, boat trip or an arts or craft gallery you will find it here. The Island of Skye is 50 miles long and the largest of the Inner Hebrides. The capital is Portree. Villages in the north of the Island include Dunvegan, Edinbane, Uig and Staffin. Notable villages in the south of Skye include Broadford, Armadale, Carbost, Elgol and Kyleakin. The Island has a rich History covering many topics, such as: Dinosaur Fossils, Clan Warfare, Highland Clearances and the infamous ‘Bonnie Prince Charlie’ and the Jacobite Rebellion. Both Clan MacDonald and Clan MacLeod have their Clan Castles on the Island and should be on your list of places to visit. The Isle of Skye is also a great destination for Wildlife watching with the White Tailed Sea Eagle at the top of bird watchers lists. Otters, seals, whales, dolphins and red deer are just some of the other impressive creatures that can be seen on and around the Isle of Skye. Skye is a world class destination for walkers and climbers. ‘The Cuillin Range’ and ‘The Trotternish Ridge’ offer challenging climbs and interesting scrambles. The Cuillin Range offers 12 Munros - peaks above 3000ft (914m). There are many great walks on Skye to be enjoyed by the less experienced, check out our Top Ten Skye Walks. Browse our listings to plan your stay on the Isle of Skye in Scotland. 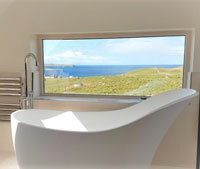 Situated on the stunning Trotternish peninsula, The Old Croft House provides luxury accommodation that sleeps four in two en-suite bedrooms (1 king, 1 twin). It is a warm, well equipped ‘home from home’ (fibre broadband, sauna) in a lovely, quiet location with panoramic sea views across the bay.